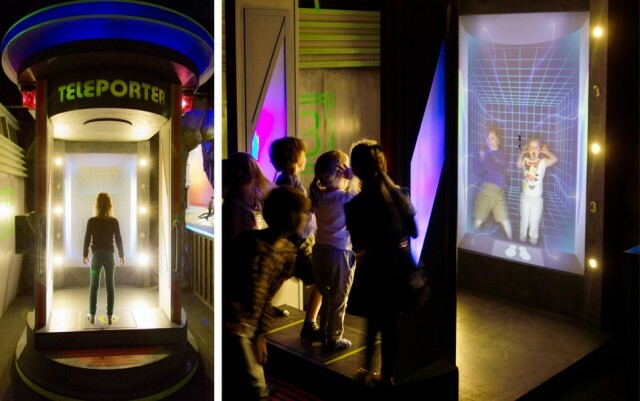 Monobanda created an interactive attraction for the indoor playground Kids Wonderland. The challenge was to create a pleasant experience and at the same time take into account the requirements. - Efficient flow of visiting children so they each get a turn. - An installation that is self explanatory and doesn’t require any explanation or instructions. - Durable and hard wearing. - Connected to the theme of an indoor playground. - Sparking creativity and challenging children to experience something new. In the Teleporter you will see a hologram of yourself. You will be scanned and subsequently a countdown starts. At zero you need to jump as high as you possibly can. Your hologram will immediately be launched into space, in which you float between flying saucers and aliens. You can view yourself on the space-screen in the pose you took when you jumped. Experiment with strange and crazy positions and imagine yourself in space in many funny ways.